If you forget to have original documents to travel by car, you do not even have to obtain a license. Just keep the records digitally. Digilaker, MP Transfer accepts digital documents stored in mobile applications with legal validity. The Chief of State police issued a circular demanding that the Registrar be considered as the authorized signatory to the creation of the paperless digital system. The vehicle owner, driver’s license, vehicle registration certificate and insurance certificate must be provided for inspection when required by law enforcement officers under the Vehicles Act 1988 and the Motor Vehicles Act 1989. However, the digital version of the digitized version of the digital copy of the digitally-installed version of the document under the IT law is sufficient to display it. No need to refrain from copying the original copy or the paper copy. Digital lockers can be used to view or share the type of documents when they are needed without uploading them in paper form. Those who have set up a Diviler application in a mobile phone, tab, etc. can show documents when they need them. Digilocker is designed on the idea of paperless governance, a platform for the issuance and verification of documents and certificates in a digital way, thus eliminating the use of physical documents. Indian nationals who participate in the Digilocker account receive dedicated cloud storage space associated with their Aadhaar number (Uidai). Companies registered with Digital Locker can pay electronic copies of documents and certificates (such as driver’s license, voter ID, school certificates) directly to citizens ‘ lockers. Citizens can also upload scanned copies of their old documents into their accounts. These old documents can be signed electronically using the eSign attachment. Citizens can access their digital documents at anytime, anywhere and share them online. This is convenient and time saving. It reduces administrative administrative expenses of government departments by reducing the use of paper. The digital locker makes it easy to validate documents as they are issued directly by registered exporters. Self-loading documents can be signed using the ESign tool (which resembles the self-authentication process). Issuer: An entity that issues electronic documents to individuals in a standard format and makes them available electronically, for example. CBSE, Registrar Office, Income Tax department, etc. Resident: Person using the Digital Locker service based on Aadhaar number. Repository: A collection of electronic documents that are displayed via standard APIs for secure real-time access. Access Gateway: A secure online mechanism for applicants to access electronic documents from different repositories in real time using the URI (Unified resource indicator). 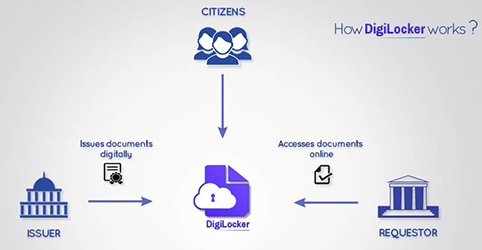 Digilocker Portal: A dedicated cloud-based personal storage space, linked to a aadhaar for each resident to store electronic documents, or electronic document URI addresses.